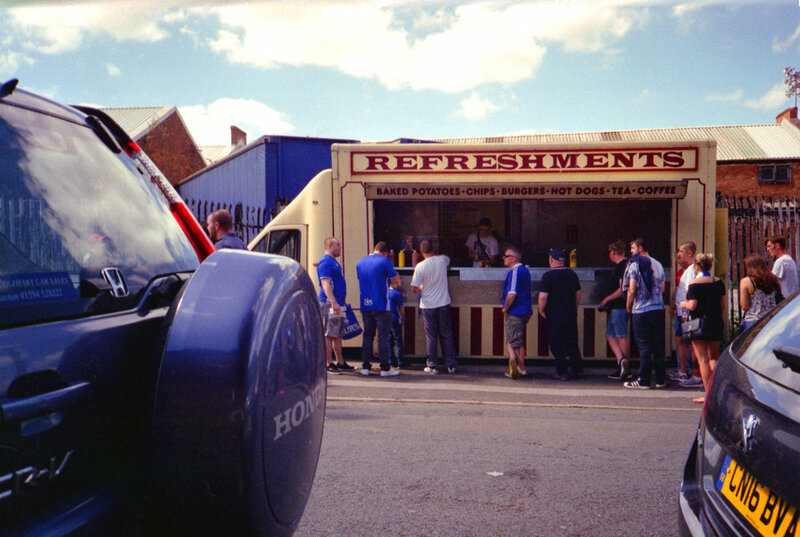 With the football season starting up again it was time to take a trip to Birmingham and see how the pre match vibe shaped up at St Andrews, home of Birmingham City Football Club. Blues first game was at home to Cardiff so a good start to take in the new season in the old home town. Photos at footie stadiums are great exercises in stealth and discretion, so stupid big cameras wouldn't make the grade. It was time to pull out the Nikon L35AF and the Fuji X100 as my back up, both near silent and unobtrusive making it easy to snap and move onto the next. Oh by the way this ain't a camera review there are others who can spend ages talking about buttons switches and all that stuff much better than I can, check out Hamish at http://www.35mmc.com he writes amazing reviews about the mechanics and stuff. Stomping city streets with a discreet light box is the best thing, no qualms in snapping what's is around me or awkwardness to being seen snapping. Funnily I feel more at home street snapping like that than say at an Instameet, but I get that this type of shooting can be a big mental challenge and vey daunting. Anyway the Nikon was smarts as usual, Poundland film and fresh batteries and that was it, off to Brum in baking Brummie heat. Being a native Brum I was sure to spot a friendly face or three knocking about so yeah no surprise too see a few types off to the game. Always good to have a quick chin wag with old faces. I will say this to anyone wanting to try out shooting around things like this, travel light don't take the big cameras and lens, you will look like a dork and stand out folk will be suspicious of your look and it won't lend to the candid nature kind of needed. Find small quiet cameras, less fancy the better, wear dark clothes, black hides the tog in the wilds of street snapping, be cheery folk like to show off and be seen. The trick to film is you have limited shots, so wander round take that step back scope out the goings-on trust me its worth it. Have a natter with folks then disappear again, into the mix find more to shoot... But do it you will love it!!! Go for a walk and snap the world that opens up in front of you. As for the game Blues drew 0-0 with Cardiff, sun stayed out though.